This early film on Germany sets up Hitler as the villain, with ominous music overlaid on images of the German dictator sitting in shadows (1). His dark repose may be because they want to hide the fact that he is an actor, but it also creates the sensation that he is a malevolent figure in Europe's political scene. 3: she signs an all-Europe pact against unprovoked air attack. Agreeing to this plan "would tie Hitler's ambitious hands." Yet with England reportedly ready to stand fast against an aggressive Hitler, "he knows that England is on guard." 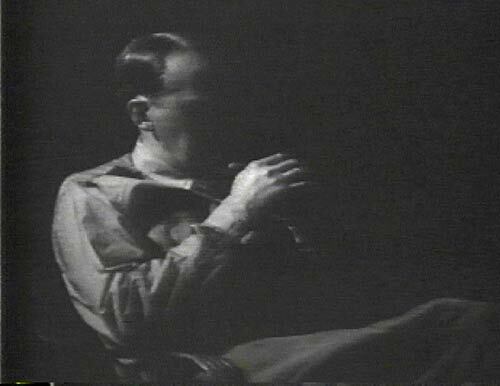 Hitler (an actor) appears in silhouette at the close and beginning of the film, a "lone, strange man to brood over a bitter fact: he's just been forced to realize he's the most suspected, most distrusted ruler in the world today. In two short years Adolf Hitler has lost for his country what Germany had nearly regained: the world's sympathy." The March of Time overestimates the League's ability to rein in Hitler, and mistakenly paints him as a man who cares about what the rest of the world thinks. The March of Time explains that when Hitler met with Italian general Benito Mussolini, "Europe feared what he and Mussolini might be plotting, but not for long." A short month later, Mussolini's "friend," Vienna's chancellor, is assassinated by Hitler's Austrian followers. Mussolini subsequently swears to protect Austria from further Nazi assaults, while suspicious England declares that Britain's border is now the Rhine River. Once Hindenburg dies and Hitler becomes supreme sole ruler, the "war babies of 1914 are marching." The March of Time describes efforts by the French foreign minister to rally all of Europe to clamp down on Germany, but to some extent Europe has already failed; Germany has re-armed the Saar. 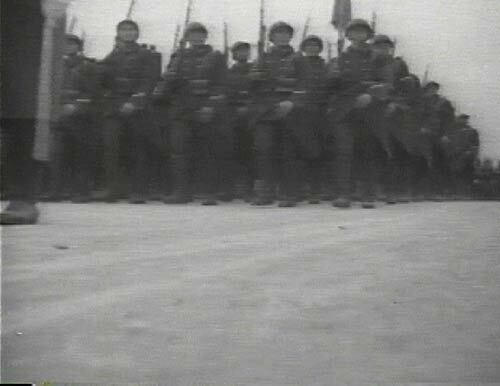 The March of Time depicts larger-than-life soldiers marching in unending rows, including shots angled from the viewers' seats, making them appear more ominous (3). England, France and bordering countries deliver the ultimatum, and "not to accept this ultimatum would be a declaration to the world that [Hitler] plans to burst Germany's frontier. "He sees the ring of powerful nations ready to check his every move. He knows that Europe is on guard." The March of Time's optimism would later be muffled by Europeans' failure to act against Hitler's aggression. This radio bit dramatizes conversations between future British Foreign Minister Anthony Eden and Russia's Joseph Stalin as they ruminate over Germany's intentions before the upcoming Stresa Conference. While the real discussion was reportedly "behind closed doors," The March of Time imagines its own dialogue. The stage is set by Germany's announcement that "England must realize that only Germany stands between Europe and Soviet Russia." Germany must have an army of a million men to prevent the Soviets from Bolshivism and revolution from spreading through Europe. Following these words, Capt. Anthony Eden, Minister of Peace, leaves Berlin for Moscow to meet Maxim Rabinov, who drinks to King George's health—the first time in Soviet history a member of the Communistic government, the "arch-enemy of capitalism," drinks to a British king. Eden next meets with Stalin. Stalin: "What is your opinion about Hitler?" Eden is convinced of his sincerity after a conference with him. "But I do not feel that Herr Hitler is either reasonable or open to reason." Stalin: What is the danger compared to 1914? Eden: "I believe the danger is definitely less now than it was then." Stalin: "I hope you're right, Captain Eden, but I fear I cannot agree with you. In my opinion, the danger today is much greater. In 1914, there was only one nation whose ambition to expand created war. In 1925, there are two such nations, one in Europe, one in the Far East: Germany and Japan." Eden: England opposes surrounding Germany with hostile powers and instead proposes a new non-aggression pact. Stalin: England is small, but they will decide whether power will be checked, and can say whether conquest will be checked. "Russia will join England in the general security pact to include Germany." Eden responds that England opposes surrounding Germany with hostile powers and instead proposes a new non-aggression pact. Stalin notes that the British Isles are small, but they can decide whether power will be checked. "Russia will join England in the general security pact to include Germany," he announces. The Voice of Time notes that for the first time since the fall of Czar Nicholas, Russia and England are in accord on foreign policy. As Eden boards the plane for Warsaw, a Russian band strikes up "Who's Afraid of the Big Bad Wolf" to make fun of Germany. But Polish leaders refuse to commit to the Eden peace plan, and later Mussolini predicts there will be no miracle to end a nightmare at the Stresa Conference, as some predict. Instead the conference will herald "the end of the dangerous utopias of disarmament." APRIL 5, 1935: What does Nazi Germany Want? An early radio segment on Hitler ponders the question, "What does Nazi Germany want?" 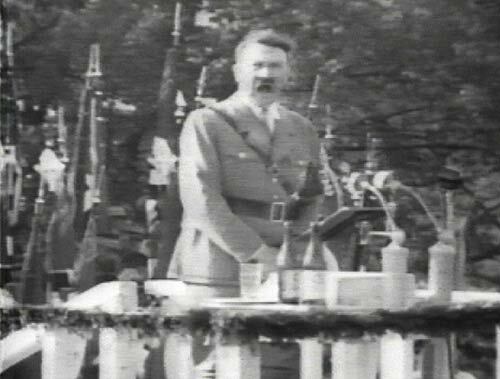 Listeners hear a "guttural monologue of German oratory" from Hitler. Hitler wants the ability for Poland and Germany to settle the question of the Polish corridor—not other European powers. "Can Hitler gain the corridor without a Russian war?" the Voice of Time asks. Germany insists it will not return to the League unless on equal footing with other members. Hitler also demands that Austrian citizens be able to vote on whether they want to form a diplomatic union with Germany, but observers believe "Il Duce" Mussolini will go to war overnight if Hitler attempts to seize power in Austria. Hitler wants "man-for-man equality with Russia, gun-for-gun equality with France and plane-for-plane equality with England." If he gets his demands, he'll have "an army greater than the Kaiser's," the narrator intones. While England ponders Hitler's demands, France hastens to cement a powerful alliance with Russia, and the world's attention turns to Italy, to the Stresa Conference, where England, France, and Italy "will meet for a three-power parley that may be a last round-up on Adolf Hitler." This segment offered a gothic tale that also managed to indict Germany for secret interference in Spain's Civil War, in which The March of Time repeatedly accused Germany and Italy of fueling fascism to detrimental effect. The story tells a tale of cargo mysterious even to the Germans sailors on the ship—boxes 8 feet square. During the sea voyage home, men try to peek inside the boxes, but what they are holding becomes apparent when vultures appear on the scene. A doctor complains to an official that "we need ice." At last they make the port of Bremen, but no one wants the job of unloading the cargo. One seaman explains, "I was in a war, lots of us were. And we all know what that smell means." Their commander tells them they should be proud—"they died for the Fatherland." "Chicago Bans Film Exposing Situation Under Nazis' Rule." The Washington Post. 19 January 1938: X26. "'The March of Time Fades Out of Amusement Scene, Bowing to Country's International Relationships." The Washington Post. 20 January 1938: X6. "Audience Boos at Film Story of Nazis' Rise." The Washington Post. 21 January 1938: X5. "'March of Time' Takes 'Rap' for No Apparent Reason." The Washington Post. 21 January 1938: X6. "Showing of Film on Nazis Guarded." The New York Times. 21 January 1938: 14. "Movie Version of Nazis Gets Calm Reception." 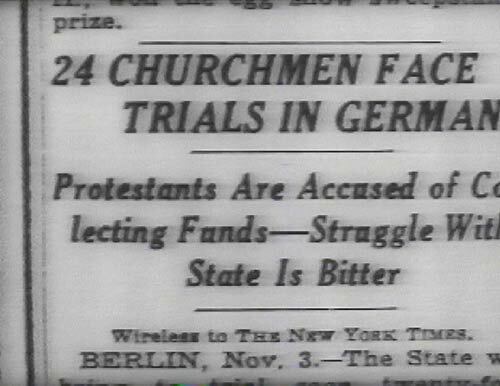 The Washington Post, 22 January 1938: X26. American Fuhrer's Anger at "Inside Germany" screening. Selection from "Luise Rainer Plans Vacation In Europe Within Few Weeks." The Washington Post. 30 January 1938: TS2. "Inside Nazi Germany—1938" was by far The March of Time's most controversial film. 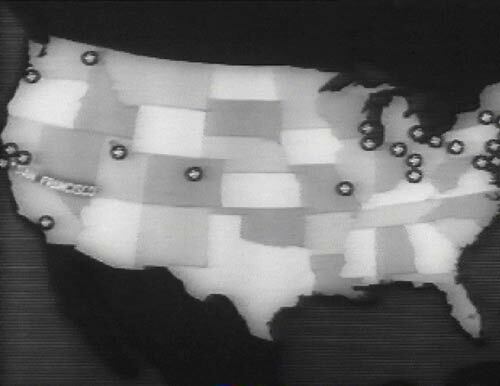 One newspaper account of a showing of the film in New York noted, "The film was press-agented as 'sensational,' to the extent that detectives from the alien squad were in the theater at the first showing at 6 p.m., and a special detail of police was placed outside to regulate crowds." 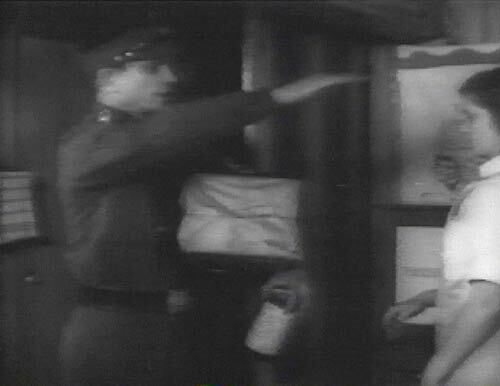 It faced censorship from some quarters and was labeled both pro-Nazi and anti-Nazi, partly because its narration varies so widely from its visual content. Germany is revealed as opposing American values: freedom of religion, freedom of speech, a free economy, and individuality. Germany is greedy, the narrator implies, asking that her territories lost during the war be returned. There are signs that Russia may be a future victim: a Goebbels musem fans Nazi hatred of Russia. The attack isn't solely focused on communists. "Though six years ago six million Germans voted a communist ticket, every known radical, every know liberal today is either in hiding, in prison, or dead." 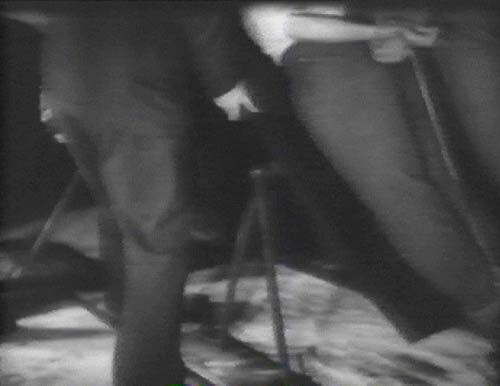 As the narrator says "in hiding," a guillotine flashes across the screen, and staged torture scenes follow (1). 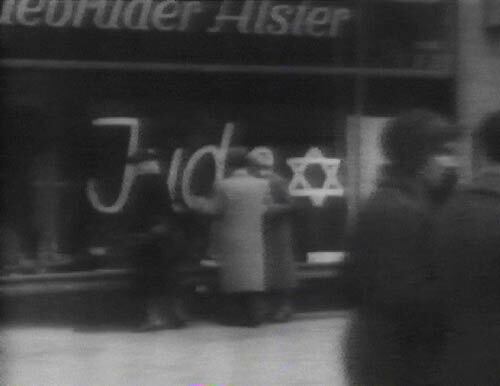 Most repugnant is Germany's treatment of Jews; sign posts show that Jews are not wanted (2). Even in parks, special yellow benches are labeled for Jews. Hitler is also bearing down savagely on Christian churches (3): "Millions of Germans who all their lives have cherished their religion, are learning a new commandment—to the good Nazi, not even God stands above Hitler." This fact would no doubt inflame Americans, still highly religious and considerate of Judeo-Christian values. The narrator explains that all radio programs come from the Department of Propaganda, and any letter in the mail is subject to censorship, "for in Nazi Germany, every instrument that forms thought, communicates ideas, must be used to glorify the Nazi superstate and its demigod, Adolf Hitler." Bankrupt Germany must import iron ore to feed its territorial desires, and to pay for it must cut down "dollar for dollar on the imports that might be going to feed its people." Germans are fabricating machines of war rather than putting their efforts toward productive peace, the narrator claims. "But a grateful worker forgets when he comes home at night how much he is paying for his security," the narrator intones. Even German households are run by propaganda decrees. It's considered patriotic to wear clothes as long as they will last, and families must save garbage to feed the pigs. Germans are also required to contribute once a month to relief funds (4)—one family saved by serving a one-dish meal last Sunday. Prices are government-controlled and are kept high to benefit the farmer. He's told he's the bulwark of the new nation, and must meet a fixed quota. Germany now produces 85 percent of the food it needs, but according to the German government must expand to be 100 percent self-sustaining. "Louder than ever from public and the headquarters that Germany must have more land to grow grain." The show re-enacts Germans hearing propaganda, including radio broadcasts of how much worse off other nations are. 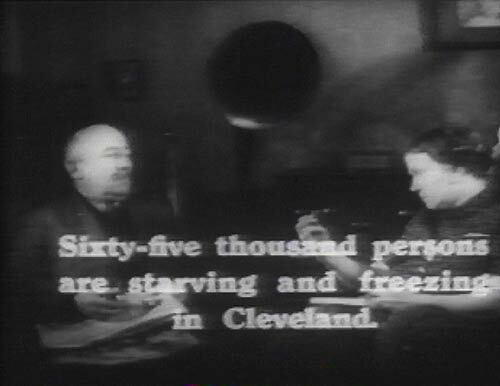 The screen flashes text as a German couple listens (5): "hundreds killed in riots of Communist strikers in Detroit." German life is very regimented: there are special Nazi awards for obedience, and special training and preparation of adolescents—but individuality is destroyed. "From the time the German child is old enough to understand anything, he ceases to be an individual and is taught that he was born to die for the Fatherland. Scarcely out of kindergarten, the child must take the place allotted to him in the great Nazi scheme, and from then on think and act as he is told." German boys receive their first uniform and rank at age 14. "Along with her brother, the Nazi girl is taken over by the state." Girls must work without pay, but are schooled in how to conserve food, and "how to care for the babies the army expects her to bear.... Because Hitler believes that too much education is dangerous, the young Nazi gets his only schooling after working hours, a daily lecture on Germany's need for expansion, and the triumph he will share when German armies march into the rich wheat fields of the Russian Ukraine." While families conserve food, storm troopers get food in abundance. German men are brought up in a group, trained in a group, and they join the Nazi military for one full year and are in the reserves for the rest of their lives. An intertitle opens a section implying that Nazism could spread: "But propaganda extends far beyond Fascist frontiers—and today Hitler expects every German everywhere to help spread the Nazi creed." The film shows that Nazism has already infiltrated America through German-American Bunds. American Bund leader Fritz Kuhn claims to have enrolled 200,000 German-Americans. "Fuhrer" Kuhn estimates there are 25 summer camps (6 shows this infiltration) and drill grounds "where those German-Americans who believe in Nazi teachings can imitate Hitler's mighty military machine." 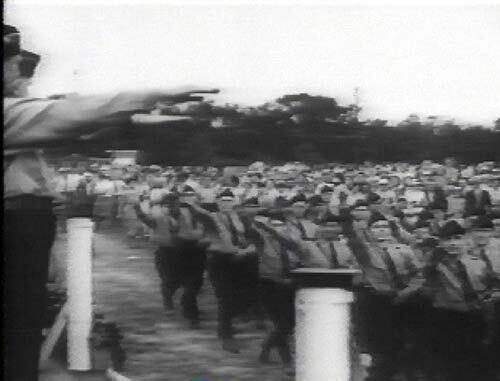 In New York, at meetings designed to promote friendship with Germany, uniformed Nazis parade. "Their mere appearance doubles the picket line" because of protests (7). Kuhn tries to purchase a site in Connecticut but meets opposition "in a community long-proud of its tolerance." Townspeople protest against the insidious activities of Nazi agents masquerading as American citizens. An elderly woman stands up in a town hall meeting and explains that her ancestors fought for liberty: "I call upon all of you here to keep the Nazis out." The most discouraging blow to the Nazi campaign comes from retiring American ambassador to Germany, who calls the situation in Europe a world crisis, the greatest since Napoleon. Intertitle: "The censure of the world's democracies, however, is of small concern to the Fascist leaders who have long boasted that while Democracy talks, Fascism acts." The Voice of Time explains, "The two strong men of fascism [Mussolini and Hitler] view the results of their long struggle for dominance in Europe with unconcealed satisfaction." So far the leaders have triumphed in rearming the Rhineland, conquering Ethiopia, re-arming the Saar basin, aiding the revolt in Spain, and making a new Rome-Berlin-Tokyo alliance. Around them other nations are inoculated with the "fascist fever. "But of the fascist nations in Europe today, Germany emerges as the supreme example: democracy is destroyed, the dictator is a demigod who can do no wrong, propaganda dominates the nation's mind, Nazi Germany faces her destiny with one of the great war machines in history. And the inevitable destiny of the great war machines of the past has been to destroy the face of the world, its people, and the governments of their time." 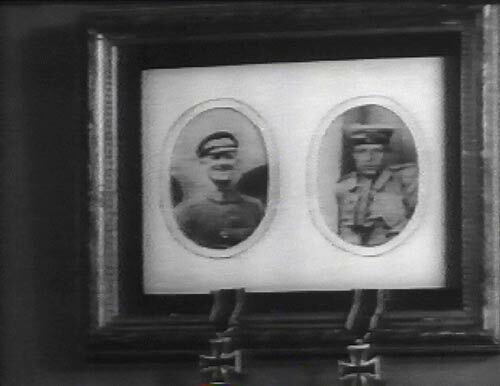 The scene shows an elderly woman knitting, and the camera zooms in to view pictures of family soldiers with Prussian crosses (8), reminding viewers of casualties on both sides of World War I. "Time marches on!" This clip re-enacts the split among German leaders over whether to aid Franco's Spanish rebels. Many high-ranking , old-line conservatives in the Reich oppose alliances with Spain and Italy because of drained resources. Hitler strikes back at those who question him. Throughout the night there is word of a political crisis, and press and radio reports are censored while foreign newspapers are confiscated [the music crescendos]. The Ambassador to Austria, who is revealed to have opposed the alliances, is ordered to return to Berlin and relieved of his post. In the next 24 hours, the ambassadors to Italy and Japan also are recalled. Chief of Secret Police Himmler arrests Bernard von Fritz. The radio silence is finally broken by Goebbels, who announces the resignations of the defense minister, army commander-in-chief, foreign minister, and several diplomats. 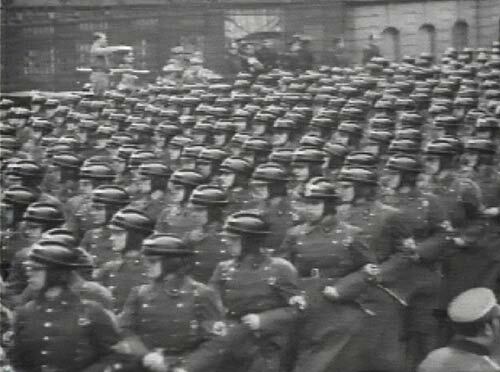 Thus Hitler purges 180 rebellious conservatives from the German army and diplomatic corps. The March of Time narrator questions, does the purge of 1938 presage new action by Germany?